This entry was posted on Monday, November 17, 2008 and is filed under Divine Rememberance , Spirituality , war on nafs . You can follow any responses to this entry through the RSS 2.0 feed. You can leave a response, or trackback from your own site. Wow BrNaeem. your post amaze me. i just read this and i felt like crying. this is just so powerful moving, inspriring. are you planning to go to hajj? the kabah is probably like you say, when you go there, the kabah silently says all this to you. 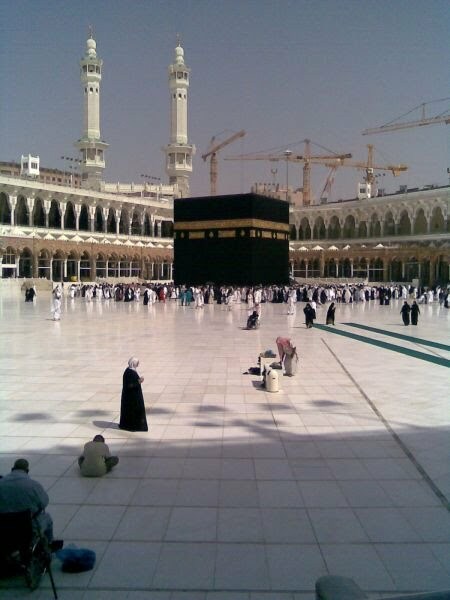 thing is that the point about how we go to the kabah thinking to soften our hearts how we really dont. I know I'm going to be the odd one out here. And because I'm a coward and I'm afraid of all of your judgments, I'm going to hide behind the anonymous identity. Why does islam insist on being so angry and bitter and resentful towards the believer? Must we always view ourselves as perpetual failures? Is mentally abusing ourselves a requirement for God's approval? Don't get me wrong, I understand the importance of humility- but I've always seen humility as a natural response to recognizing the awesomeness- the inconceivable perfection of GOD. I can't fathom how it can come from self degradation. I can feel that this was a really heartfelt post, but I have to agree with anonymous here. I cannot imagine God insulting you when you come to Him. He runs to you when you walk to Him, which means He is more eager to see you than you are to meet Him. Why would He yell at you when you come to His house? Anon and Muse, good points. Despite the harsh tone of this post, I really do believe that faith is a bird with two wings of fear and hope (sound familiar Muse? heh) and not just fear. But as one view goes, when you're young and vibrant (and with the great potential for sin), fear should trump hope as a means of reigning in your desires. And when you're older, and reality sets in (that you will soon stand before your Lord), hope should trump fear and you should hope and pray for Allah's mercy. Additionally, its all about controlling, defeating, even crushing the nafs and its evil machinations. Humility bound with constant reminders of one's faults is good way to achieve that. As one saint said, Heaven is but two steps away - first step on your nafs, then step straight into heaven. BTW Muse, it wasn't God who was yelling and denouncing me, it was the Ka'bah. In fact, afterwards my only recourse was to turn to our Most Compassionate, Loving God, seeking His mercy and consolation. Islam is too vast to be contained within one expression. And there are many forms of expression which are still at the level that the uninitiated might appreciate, which are both soft and gentle on the ego. However, it is true that 'struggling', sacrificing is not easy, and its natural to conclude that the greatest Jihad (against the ego) is not going to be easy. Islam doesn't insist on being angry and bitter and resentful. It is better to know that 'self-esteem', which yields the result of pride and self-worth, the fuel for anger, jealousy and egoism, is a more subtle and more devious form of mental abuse. Anyway, modern expressions of this battle against the ego, without a guide or at least a surrounding spiritual culture, are usually misinformed and lose their mark. Here is an example of a trained expression of love, fear, humbleness, and courage. @MuslimKid, ""Why does islam insist on being so angry and bitter and resentful towards the believer? "" But Allah (or Islam) is NOT angry and bitter and resentful towards the believer. It is we who must be angry and bitter against ourselves for having let down our Lord, for having oppressed our selves, for having wronged so many, etc. @Yursil, "It is better to know that 'self-esteem', which yields the result of pride and self-worth, the fuel for anger, jealousy and egoism, is a more subtle and more devious form of mental abuse." Well said...I couldn't have said it better myself. Thank you bro! Subhan'Allah, this is an amazing post. It has changed the way I pray. Jazak Allah khair and may Allah bless you & accept your supplications! This is a great post. Subhanallah! I have to say that although this post is a very powerful reminder, it also has great comedy value. The way you describe the Ka'ba talking is very, very funny. Also, to the ppl saying that it is too harsh-I say kudos to Naeem for recognizing his weakness and sins and that although Allah is MOST Merciful, we are all full of sins and wrongdoings, that is how Allah created us. This is similar to the authentic hadith of how the black rock was originally white, but turned white due to the sins of mankind. honestly, the self needs a good mental beating once in a while. we can get so arrogant and conceited when in reality we're just a sad sad cookie. look at how man quickly criticizes his brother, how he wants the best for himself first, how he thinks his way is THE way, etc. you have to have an amazingly strong connection to Allah and always bring your self to account to repel arrogance from your heart. such a concept in the west is unheard of though. its all about me me me, and doubting yourself or looking down on your faults is considered low self esteem. nothing can be farther from the truth, it takes a strong, clear, eman filled heart to say: HEY, I NEED TO CHANGE, AND I CAN DO IT WITH ALLAH'S HELP. I never really dropped by to read through your blog. But ma sha Allah bro, I can say you and I are very similar. This piece was excellent, it definitely has the right mindset in understanding Allah speaks to us in ways more numerous than we ever notice. I advise everyone to take a listen to it! "I never really dropped by to read through your blog. But ma sha Allah bro, I can say you and I are very similar." Welcome bro...I've been a long time reader of your blog, and yes we are similar in many ways. Anon, "In reality the kabba didn't really talk to you..."
Yes, you are right, the Ka'bah didn't really transform into a talking being. The experience took place completely in my head.